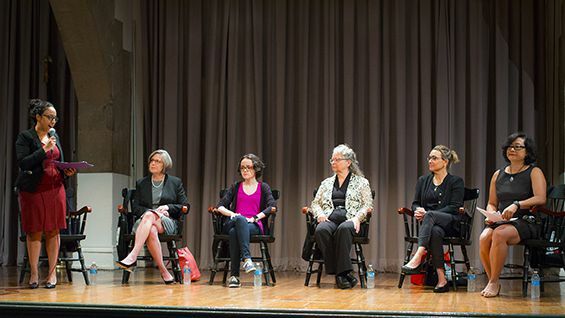 Five women working in the fields of Science, Technology, Engineering and/or Math (STEM) appeared on stage in The Great Hall for a free, public discussion on "Women in STEM" on July 23rd. The panel convened in front of an audience made up mostly by high school students participating in the Summer STEM program. The panelists presented living models for the possibilities for success for women in fields that continue have a significant gender gap in the United States. "A good part of this is paving your own path," Minerva Tantoco, New York City's first-ever chief technology officer, said in her opening remarks. She recalled her past experience working for Bank of America where she was not just the only woman working in the technology department but "the only woman in the building." She went on to point out how times have changed saying there are now 300,000 jobs in the "tech ecosystem" of New York City. "New York City's tech moment is now," she told the audience, and noted the importance of diversity in that marketplace. Other panelists included Cristina Dolan, who has worked in the tech industry for 20 years; Margaret Dohnalek, the global beverage category scout at PepsiCo; Zlata Barshteyn EE'12, a software engineer at Google; and Bonnie John ME'77, a senior interaction designer at Bloomberg, LP. 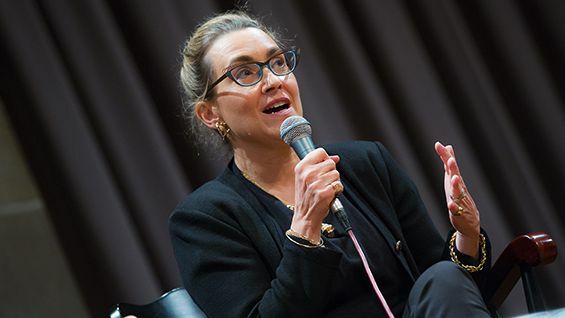 The moderator, Jolie Harris Woodson, director of engineering career development and outreach at The Cooper Union's Center for Career Development, asked each panelist to describe a typical day and what they liked most about their jobs. She then asked them what they would say to their younger selves, at the same age as the audience. "Science and technology played a role in every career that I thought might be interesting," Margaret Dohnalek said and, after telling students to commit to their education and grab opportunities as they come, added, "I couldn't be happier." Zlata Barshteyn, only a few years older than most of the audience, advised them: "Don't accept setbacks. Obstacles should be seen as fun challenges. If someone tells you that you can't do it, of if you tell yourself you can't do it, prove them wrong." 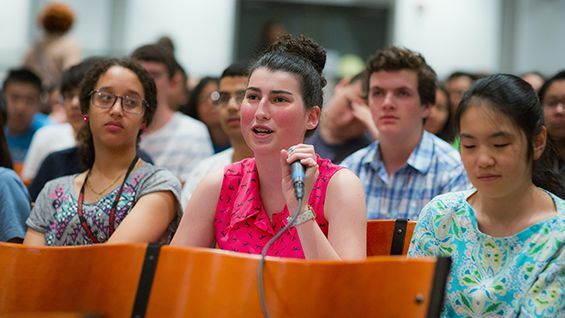 The Summer STEM program, a high-school outreach effort established nearly 30 years ago at the Albert Nerken School of Engineering, sponsored the panel, which was open to the public. In 2014 Summer STEM convened a similar panel of surviving members of the Tuskegee Airmen, the African-American squad of Second World War pilots. During the Q&A period a young audience member asked the big question: Why is there is such disparity in the STEM fields and what can be done about it? 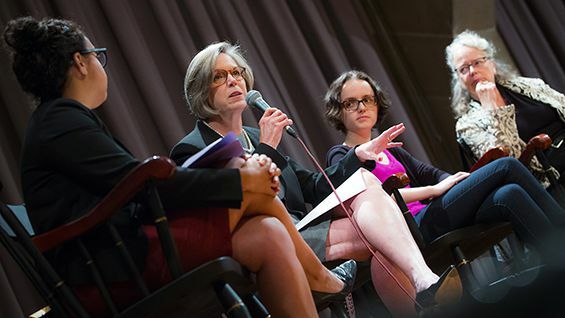 Bonnie John, a longtime academic at Carnegie Mellon, noted the importance of better training for high school teachers in STEM fields, as well as fostering communities of women undergraduates in the STEM fields. Cristina Dolan, who founded Dream It. Code It. Win It., a software competition focusing on problem solving, pointed out that women respond better to engineering programs based on solution-finding. 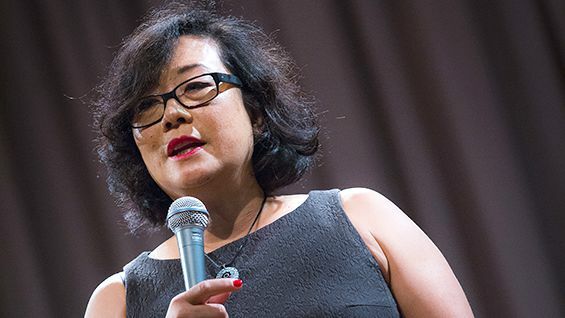 "You can create opportunities by applying engineering toward solving problems," she said. "My mother wanted me to be an attorney. People tell you as an attorney you can go off and do anything with that. I think that's true of engineering now. You can apply it toward anything at all."